The European shag or common shag (Phalacrocorax aristotelis) is a species of cormorant. It breeds around the rocky coasts of western and southern Europe, southwest Asia and north Africa, mainly wintering in its breeding range except for the northernmost birds. In Britain this seabird is usually referred to as simply the shag. The scientific genus name is Latinised Ancient Greek, from φαλακρός (phalakros, "bald") and κόραξ (korax, "raven"). The species name aristotelis commemorates the Greek philosopher Aristotle. This is a medium-large black bird, 68 to 78 cm (27 to 31 in) long and with a 95-to-110-centimetre (37 to 43 in) wingspan. It has a longish tail and yellow throat-patch. Adults have a small crest in the breeding season. It is distinguished from the great cormorant by its smaller size, lighter build, thinner bill, and, in breeding adults, by the crest and metallic green-tinged sheen on the feathers. Among those differences are that a shag has a lighter, narrower beak; and the juvenile shag has darker underparts. The European shag's tail has 12 feathers, the great cormorant's 14 feathers. The green sheen on the feathers results in the alternative name green cormorant sometimes being given to the European shag. The European shag is one of the deepest divers among the cormorant family. Using depth gauges, European shags have been shown to dive to at least 45 m (148 ft). European shags are preponderantly benthic feeders, i.e. they find their prey on the sea bottom. They will eat a wide range of fish but their commonest prey is the sand eel. Shags will travel many kilometres from their roosting sites in order to feed. In UK coastal waters, dive times are typically around 20 to 45 seconds, with a recovery time of around 15 seconds between dives; this is consistent with aerobic diving, i.e. the bird depends on the oxygen in its lungs and dissolved in its bloodstream during the dive. When they dive, they jump out of the water first to give extra impetus to the dive. It breeds on coasts, nesting on rocky ledges or in crevices or small caves. The nests are untidy heaps of rotting seaweed or twigs cemented together by the bird's own guano. The nesting season is long, beginning in late February but some nests not started until May or even later. Three eggs are laid. Their chicks hatch without down and so they rely totally on their parents for warmth, often for a period of two months before they can fly. Fledging may occur at any time from early June to late August, exceptionally to mid-October. The shag is a pursuit-diving seabird that feeds predominantly in benthic habitats. Due to the relative ease with which diet samples can be collected from this species (regurgitated food or pellets) and the perceived conflict between the Phalacrocoracidae and fisheries, shag diet competition has been the subject of substantial scientific interest. Evidence collected at one colony, the Isle of May, Scotland, between 1985 and 2014, suggests that shag chick diet composition in this population has diversified in response to ocean warming. Shags also feed on fewer sandeel on windy days, presumably due to the strong effect of wind on flight in this species. The year-round diet of full-grown shags at this colony has also over the past 3 decades, from sandeel specialists to an increasingly diverse prey base. The subspecies differ slightly in bill size and the breast and leg colour of young birds. Recent evidence suggests that birds on the Atlantic coast of southwest Europe are distinct from all three, and may be an as-yet undescribed subspecies. 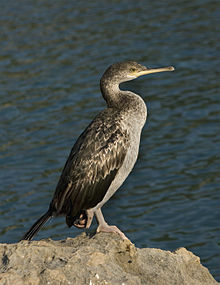 The name shag is also used in the Southern Hemisphere for several additional species of cormorants. The European shag can be readily be seen at the following breeding locations in the season (late April to mid July): Saltee Islands, Ireland; Farne Islands, England; Isle of May, Deerness and Fowlsheugh, Scotland; Runde, Norway; Iceland, Faroe Islands and Galicia. In April 2017, eight new European shags were born in Monaco. The largest colony of European shags is in the Cíes Islands, Spain, with 2,500 pairs (25% of the world's population). ^ "Annotated List of the Seabirds of the World - Boobies, Cormorants, Frigatebirds and Tropicbirds". www.oceanwanderers.com. Retrieved 8 October 2007. ^ Jobling, James A (2010). The Helm Dictionary of Scientific Bird Names. London: Christopher Helm. pp. 55, 301. ISBN 978-1-4081-2501-4. ^ Snow, Barbara (1960-10-01). "The Breeding Biology of the Shag Phalacrocorax Aristotelis on the Island of Lundy, Bristol Channel". Ibis. 102 (4): 554–575. doi:10.1111/j.1474-919x.1960.tb07132.x. ISSN 1474-919X. ^ Barrett, RT; Rov, N; Loen, J; Montevecchi, WA (1990). "Diets of shags Phalacrocorax aristotelis and cormorants P carbo in Norway and possible implications for gadoid stock recruitment" (PDF). Marine Ecology Progress Series. 66: 205–218. doi:10.3354/meps066205. ^ Harris, M. P.; Wanless, S. (1991). "The Importance of the Lesser Sandeel Ammodytes marinus in the Diet of the Shag Phalacrocorax aristotelis". Ornis Scandinavica (Scandinavian Journal of Ornithology). 22 (4): 375–382. doi:10.2307/3676511. JSTOR 3676511. ^ Cosolo, Mauro; Privileggi, Nicoletta; Cimador, Barbara; Sponza, Stefano (2011-11-01). "Dietary changes of Mediterranean Shags Phalacrocorax aristotelis desmarestii between the breeding and post-breeding seasons in the upper Adriatic Sea". Bird Study. 58 (4): 461–472. doi:10.1080/00063657.2011.603290. ISSN 0006-3657. ^ Howells, RJ; Burthe, SJ; Green, JA; Harris, MP; Newell, MA; Butler, A; Johns, DG; Carnell, EJ; Wanless, S (2017). "From days to decades: short- and long-term variation in environmental conditions affect offspring diet composition of a marine top predator". Marine Ecology Progress Series. 583: 227–242. doi:10.3354/meps12343. ^ Lewis, Sue; Phillips, Richard A.; Burthe, Sarah J.; Wanless, Sarah; Daunt, Francis (2015-11-01). "Contrasting responses of male and female foraging effort to year-round wind conditions". Journal of Animal Ecology. 84 (6): 1490–1496. doi:10.1111/1365-2656.12419. ISSN 1365-2656. PMC 4989534. PMID 26283625. ^ Howells, Richard J.; Burthe, Sarah J.; Green, Jonathan A.; Harris, Michael P.; Newell, Mark A.; Butler, Adam; Wanless, Sarah; Daunt, Francis (2018-11-21). "Pronounced long-term trends in year-round diet composition of the European shag Phalacrocorax aristotelis". Marine Biology. 165 (12). doi:10.1007/s00227-018-3433-9. ISSN 0025-3162. ^ Gill, F.; Donsker, D., eds. (2017). "IOC World Bird List (v 7.2)". doi:10.14344/IOC.ML.7.2. Retrieved 10 July 2017. ^ Yésou, P.; Buchheim, A.; Bermejo, A. (2005). "Which subspecies of Shag occurs in Galicia?" (PDF). British Birds. 98: 369–370. ^ Verdi, Laurent (April 12, 2017). "Naissance exceptionnelle à Monaco: huit cormorans huppés ont vu le jour". France 3 Côte d'Azur. Retrieved April 13, 2017. Wikimedia Commons has media related to Phalacrocorax aristotelis. "European shag media". Internet Bird Collection. Audio recordings of European shag on Xeno-canto.